Smokers who regularly use vapers are more likely to try and quit smoking for good, new research has suggested. In a study by University College London (UCL), smokers who frequently use e-cigarettes were found to be 20% more likely to have attempted to quit, and felt more motivated to kick the habit. Over one in four (25.8%) smokers who participated in the study said they regularly spent time with e-cigs, with a third of these having made an attempt to quit in the previous year. By contrast, only around a quarter (26.8%) of smokers who do not use vapers attempted to quit in the previous 12 months. Dr Sarah Jackson, the study's lead author, said the findings should help ease concerns that vaping can re-normalise smoking for those trying to cut down. She said: "It is becoming increasingly more commonplace for smokers to come into contact with vapers and some concerns have been raised that this could re-normalise smoking in England and undermine smokers' motivation to quit. 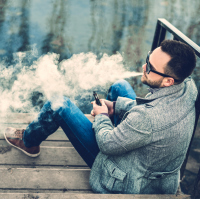 "Our results found no evidence that spending time with vapers discourages smokers from quitting, which should help to alleviate concerns about the wider public health impact of e-cigarettes." Dr Jackson added: "A key factor driving these differences may be that smokers who are regularly exposed to e-cigarette use by others are more likely to use e-cigarettes themselves. "When smokers' own use of e-cigarettes was taken into account, exposure to other people using e-cigarettes appeared to have little impact on how motivated smokers were to stop, and whether they made a recent quit attempt." Cancer Research UK's tobacco control expert Kruti Shrotri said: "There hasn't been much evidence about whether e-cigarettes might make smoking tobacco seem normal again." She added: "So it's encouraging to see that mixing with people who vape is actually motivating smokers to quit. "As the number of people who use e-cigarettes to quit smoking rises, we hope that smokers who come into contact with them are spurred on to give up tobacco for good." Are you living with cancer and looking for travel insurance that meets your specific needs? Why not check out our range of dedicated cancer medical travel insurance policies and see what cover we could offer you?